Listen to the Cancer.Net Podcast: Understanding the Costs Related to Cancer Care, adapted from this content. 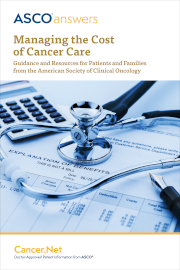 Download ASCO’s free booklet, Managing the Cost of Cancer Care, as a printable PDF in English (32 pages) or in Spanish (36 pages). Order printed copies of the booklet from the ASCO University Bookstore.